Bumblebees are large, hairy social insects with a lazy buzz and clumsy, bumbling flight. Many of them are black and yellow, and along with ladybirds and butterflies are perhaps the only insects that almost everyone likes. Go to the body pages for more about parts of the body, or the behaviour pages to learn why they do what they do, or the is it a bumblebee page to find out if it is a bumblebee at all. Queen and worker bumblebees can sting, but in all my years of working with them I have yet to be stung. For photographs and more on stings go to the sting page. It is believed that the earliest fossilized bumblebee dates from the Oligocene, around 30 million years ago, today there are around 300 bumblebee is the world. Go to the species pages to see the different species of bumblebees alive today in northern Europe and North America. There are also pages of bees that are not bumblebees, and a page of insects that are frequently mistaken for bumblebees. And finally a page where you can go through a checklist to see if the insect you have is a bumblebee. The life cycle pages will take you through the life of a bumblebee colony including images of nests, and then the help bumblebee pages will show you what you can do to help the bumblebees that live near you, and the predators page will show you what enemies the bumblebees have. Finally, I've made a few pages where frequently asked questions and their answers are. There is also a page list. It has been widely reported that Einstein said that without bees to pollinate our food crops humans would die off in just 4 years. Apparently Einstein never said this at all. It is just another urban myth. However if bees do die off it is fairly certain that life as we know it will cease with in a short time, and that there will be far fewer humans around, as there will be so much less for them to eat. So a world without bees will probably also be a world with far fewer humans. For more on what we are doing to our world you can read my rant on global warming and pollution at the bottom of the Invertebrate page. Bumblebees are found mainly in northern temperate regions, though there are a few native South American species and New Zealand has some naturalised species that were introduced around 100 years ago to pollinate red clover. They range much further north than honey bees, and colonies can be found on Ellesmere Island in northern Canada, only 880 km from the north pole! With the recent popularity of using bumblebees in glasshouse pollination they will probably be found in most parts of the world before long (see below), especially Bombus terrestris which seems to be the most popular species sold for this purpose. Recently there have been proposals to introduce bumblebees into Australia to pollinate crops in glasshouses. Now, though I dearly love bumblebees, I do think that this might not be a very good idea. No matter what security measures are taken, mated queens WILL escape eventually and that will probably lead to their establishment in the wild. And yet another non-native invasion of a country that has suffered more than most from such things. This invasion may or may not be benign, but isn't it better to err on the side of caution? Apparently there are already colonies of Bombus terrestris on Tasmania, so I suppose it is now only a matter of time before they reach the mainland. Pink38 is the name of the bumblebee pictured above. I caught and marked her just after 10 o'clock on the morning of 4th August 1995 while she was foraging on Cirsium arvense (thistle). I saw her another 10 times over the next few days, always on the same clump of thistles, or on a nearby clump of Centaurea nigra (knapweed). Pink38 wasn't special in any way. 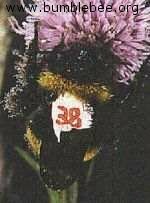 I marked, measured tongue length, head length and width of 232 bumblebees between the 2nd and 6th of August 1995, and saw 58.6% again at least once. A week or two later, after I'd finished all the work for my BSc Hons thesis, I went out with my camera to find the lane still full of bumblebees with numbers on their backs. Pink38 was just outside the door as usual, on her clump of thistles, so I took her photograph. Everything you read on this site stems from that summer measuring tongue lengths, marking, following and recording flowers visited by bumblebees foraging in a farm lane in North East Scotland. I owe it all to the good nature of a few hundred bumblebees who tolerated me disturbing them while they worked. Very few of "my" bumblebees got angry at my intrusion in their lives. If you think I am being silly, after all how could I know when a bumblebee was getting annoyed with me, well, visit the feeling threatened and the angry buzz sections, and you, too, will be able to tell when a bumblebee wants you to back off. Bumblebee.org (C) 1997 - 2019 contact/cookie info.